I have a 2000 RLX with a monsoon. I am trying to change my fuel filter near the fuel pump (mounted on motor). The existing filter shows the flow as bottom to top, but logically it seems like it should flow top to bottom. Anybody have a Response nearby that they can take a quick look? Much appreciated. Why do you think the filter was in backward? 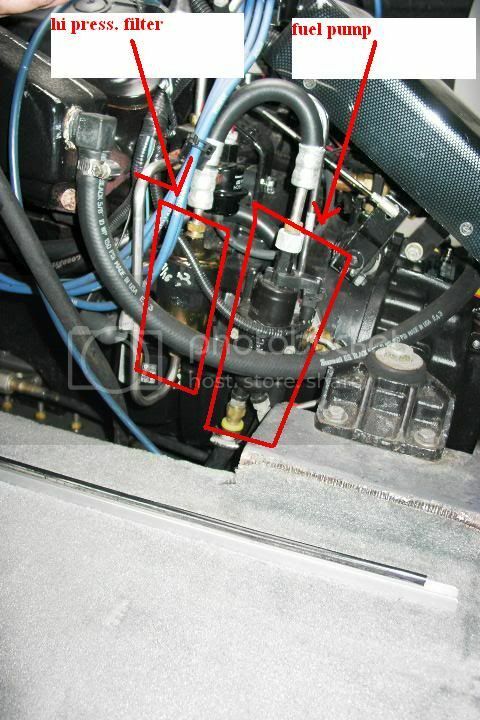 If you trace the fuel hose from the tank to the fuel rail, does the filter still seem backward? Its been a while since i worked on this generation boat. That being said, just trace your lines. The fuel goes from the tank, towards the motor. Forget if pump is before or after filter, probably after. So it would go tank, filter, pump, injectors. I'm not totally sure why I think it is in backwards. I read a thread that said it should be pointing down, but can't find that thread. I'm not with my boat so can't trace the lines right now. Attached is an image that i found on here of what it looks like. You can see the silver gas line looks to go out of the bottom of the filter and up to the top of the engine. So, to me it seems that this filter is after the pump and the flow direction should be down. I see your point now. With any luck, the filter has different sized fittings on each end so you can't put it on backward. If not, it might be best to trace the flow and put it on the way that makes sense. Yes, based on that image, flow should be down. Comes from tank, into bottom of pump, out top of pump, into top of filter, out bottom of filter, into fuel rail. I can't remember if there is a filter by the tank on this boat, or not. Worth checking. It would be behind the trunk trim.